How these forced air induction systems work and why they are the way of the future. Kawasaki’s H2 set tongues wagging and hearts pulsating with its whopping 300 horsepower supercharged engine. It’s the stuff dreams are made of, but aside from that obvious wow factor, why would you supercharge a motorcycle in a day and age where sensibility sells and extravagance is increasingly ignored? It’s all about the future: there is a big focus on the search for alternative fuel sources. Well, it’s a search that’s been on for a long time but ramped up in the past decade as emissions controls have been stringently constituted and consumers have become more environmentally conscious. In the motorcycle world we have seen bio-diesel, ethanol, hydrogen and natural gas as fuel sources for motorcycle propulsion. Hybrid motorcycles — one that runs an alternative fuel source in conjunction with a petrol or electric engine — are also in the works. Electric bikes are getting cheaper and are performing a lot better, but they are nowhere near being mainstream and cheap enough yet. As a result, the pursuit of better economy, consumption and performance is still with the combustion engine because it is cheaper and has all the characteristics that we bike riders have come to know and love. So where to next? The combustion engine has come a long way since motorcycles started rolling on two wheels and surely every avenue has been explored. Seemingly so, but it’s the avenues that were briefly travelled where manufacturers are revisiting: namely the super and turbocharger. Superchargers were created and patented in the late 1800s, used in the 1900s to power primitive combustion engines and, when engine performance improved, they were banned as they created too much power bikes at the time couldn’t handle. And that was happening in the 1940s. The turbo came into mainstream motorcycling a bit differently. In the early 1980s the landscape of the American motorcycle industry was glum. Harley-Davidson was barely surviving and Japan’s ability to produce reliable, cost-effective, high-performance motorcycles was making America, and Europe, bleed. US government intervention in the form of import tariffs on Japanese motorcycles over 700cc were brought in to save Harley and the turbo was the way to deliver the performance of a big bike and the smaller capacity to get around the tariffs – hence the likes of the Honda CX500/650, Suzuki XN85 and Yamaha XJ650T Turbos. Kawasaki beat the game shipping the parts, not whole bike into America, and assembled their GPz750 Turbo in the USA. As iconic as these bikes now are, they weren’t popular. They promised middleweight-like handling and big bike power at a good price, but the models were heavy, power characteristics weren’t good and the turbo systems complex. To make matters worse, the global motorcycle market took a big hit sales-wise and manufacturers tightened up their model line-ups. The turbo fantasy had all too quickly come to an end like the supercharger before it. It seemed like it was all too difficult to make these systems work, until Kawasaki did it all again with the supercharged H2. The complexities of supercharging systems have come a long way since World War 2 mainly thanks to developments in aeronautics, automotive and marine applications. In fact, its those lessons learnt in marine applications Kawasaki cited as the reason why the they were toying with a supercharged four-cylinder engine they displayed at the 2013 Tokyo Motor Show: the engine that was to become the Ninja H2. While Kawasaki didn’t go into any detail at the time about the engine’s future application, it clearly points to the fact that superchargers are on the agenda. Chargers are essentially pumps that give the engine an extra push by forcing more air into an engine. This in turn allows smaller capacities to be run with a supercharger or turbo and receive an output similar to a bigger-capacity engine. Where the two systems deliver in their operation is, generally, in the way they apply their initial effect due to the fact that turbos are typically operated off exhaust gases and superchargers off the crankshaft. Both systems are essentially air compressors that increase air pressure or air density to a combustion chamber. The increased amounts of oxygen can burn more fuel and thus make more power. The two systems differ where a turbo runs post-combustion. Air from the exhaust turns a turbine that increases the pressure in the inlet tract. Superchargers are operated mechanically in a number of different ways, typically off the crankshaft. Belt, gears, chains and shafts turn the compressor which, in turn, forces more air into the intake tract. There are two general negatives to the systems. With a turbo, when you twist the throttle there is a delay as an increase in exhaust gases is needed before putting the turbo into effect and pressurising the inlet tract. Revs are needed for them to work and this gap in performance is often referred to as turbo lag. Superchargers operate directly in relation to engine RPM and hence need power to make power. They can rob up to a third of an engine’s power to do their job, though a net power gain of 10 percent is typical. You really need a decent amount of outright power to see a good outright gain in power without the initial power rob causing any negative effect. 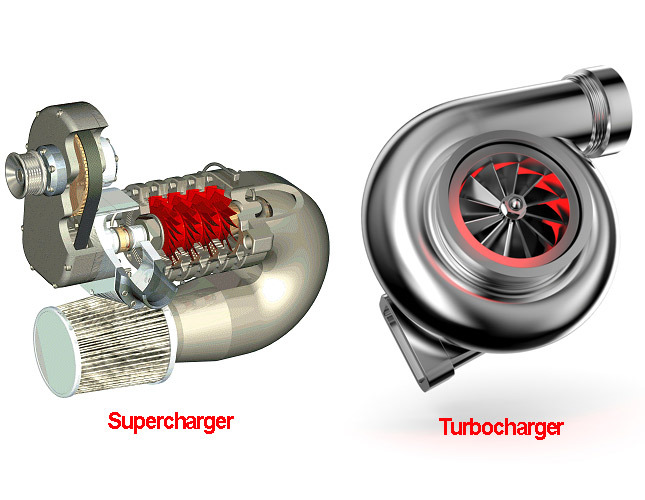 So superchargers are typically less economical and provide a smaller output gain than a turbo, but have more favourable characteristics on a motorcycle and all of the system’s benefits are available instantaneously. Turbos are better on economy, less expensive to fit and provide a bigger outright improvement, but their power delivery characteristics aren’t as good. Not any more. Efficiency of both systems has improved with the use of intercoolers cooling the air between pump and intake as the systems heat the air when it is being pressurised — something that limits the total performance improvements of these systems. But things have progressed from these “typical” traits as manufacturers seek improved economy. So evolved are charged systems these days that manufacturers have sought to eradicate both of the effects the systems have “typically” displayed in the past. Just have a look at the efforts Kawasaki has gone to with the H2 and you’ll see the future of the supercharger is looking promising. While the supercharger looks like the way forward, turbocharging is more likely to have a bigger future in motorcycling for the same reason it is so popular elsewhere in the automotive world: it provides greater power gains, is more efficient and economical. Turbos have been employed on diesel vehicles for a long time now and diesel motorcycles are running them. But the systems are big and bulky. It’s going to take a lot of development time to get them down to a size acceptable for a motorcycle.